A lightweight economic and environmentally friendly board ideal for large point of sale prints and life size cut-outs, has a smooth matt surface on the print side. 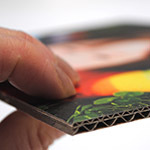 A lightweight economic and environmentally friendly board ideal for fold-up packaging and display purposes, or smaller flat prints, has a smooth matt printable surface on one side. Uses around 90% recycled paper and is recyclable.